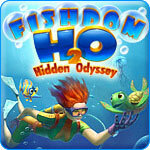 Fishdom H2O: Hidden Odyssey Game - Download and Play Free Version! Create Your Own Spectacular Aquarium! Jennifer, a marine biology student from the Environmental Protection University, finds herself in her last summer at school. She is determined to work at Old Barney's Aquarium, the largest marine conservation center in the world. But Old Barney won't hire just anyone so Jennifer will need the help of her Grandpa Jack, a famous oceanographer if she has any hope of passing the tough trial period. Help Jennifer grow an amazing aquarium from one fish to an entire school. Earn cash for more fish by taking her deep sea diving and collecting all kinds of "junk" at the bottom of the sea. Experience classic hidden object gameplay with finding a list of items amidst an underwater scene which is suitably cluttered. The items are rather typical fare, such as sweaters, guitars, pearls, and the like, yet all of the items are clearly drawn and look like they should, which is quite refreshing. While most of the objects are named, there are some which are only hinted at by a clue, such as "puts out fires" for an extinguisher, or you'll be asked to find a number of the same item. In addition, there are special "Gold Rush" levels which have you gathering as many gold items as you can in 30 seconds and "Quick Eye" rounds where you need to find one of three items in only 15 seconds. With no set levels, the hidden object gameplay really comes down to earning money for your tank so you can upgrade it in various ways. You can purchase a variety of fish to fill you tank with as well as various pieces to make the tank more beautiful, like plants, shells, coral, and ornaments. Also, you'll need to make sure your fish are comfortable with such items as lights, air pumps, and filters. With timed and relaxed modes, you'll get plenty of hours of gameplay as you work to upgrade to bigger and bigger tanks. The game also features a screen saver which reflects your progress in the game, so you can actually see the plants and fish you've bought. 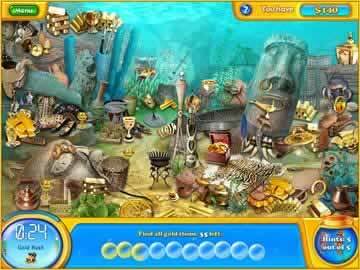 So, if you like fish raising simulations and hidden object games, download Fishdom H2O - Hidden Odyssey today! 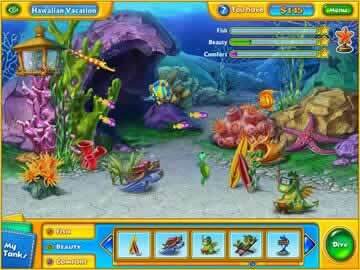 Catch some of the hidden object fun and aquarium management that can be found in Fishdom H2O Hidden Odyssey.